LG Chem introduces what I believe to be the largest OLED Lighting panel on the market at 320x110 mm. 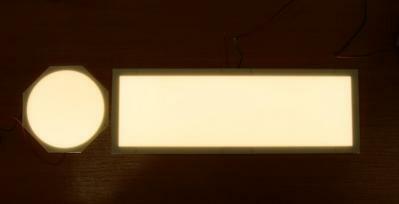 The panel features an efficacy of 60 lm/W, a high CRI (90) and is only 1 mm thick. It comes in two color variants: 3000K and 4000K. Together with this large bar-type panel (model N6BB), LG Chem also released a circular panel with a diameter of 100 mm. The N6OA has the same features as the bar panel, and both panels will be shown at the Light + Building exhibition in April. LG Chem tells us that these new panels use the company's Face-Seal encapsulation technology. This enabled LG to achieve very light and thin design and also prolonged the lifetime to 20,000 hours. This is the same encapsulation technology used in LG's flexible OLEDs.